‘X-Men: Apocalypse’ Is Bringing Fresh Faces To Supes Sequel!!! New superheroes are made everyday in the movie biz and today is no different. Bryan Singer writer/producer/director of the ‘X-Men‘ movie franchise has announced three actors that will take the mantle formerly held by veteran actors that are stepping aside for a newer generation. Singer is bringing fresh blood to the characters made film-famous by Halle Berry, Famke Janssen and James Marsden, let’s just hope the younger cast can equal the excellence their predecessors instilled in the roles of Storm, Jean Grey and Cyclops. The announcement came from Twitter last night on Singer’s account. The three super-noobs are not newbies to the screen by any means and you will most likely recognize them from previous projects. 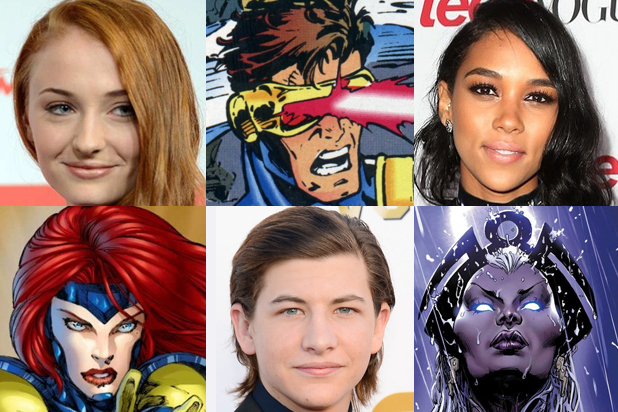 For Storm we have Alexandra Shipp from the British series ‘House of Anubis‘, taking on Jean Grey is Sophie Turner who is undoubtedly popular for her turn as Sansa in ‘Game of Thrones‘ and rounding out the list is Tye Sheridan from ‘The Tree of Life‘ and ‘Mud‘ as the ocularly impaired Cyclops. These actors will join an already established cast consisting of Jennifer Lawrence, James McAvoy and Michael Fassbender. ‘X-Men: Apocalypse‘ bows May 27, 2016. This entry was posted on Friday, January 23rd, 2015 at 12:52 pm	and is filed under Comics, Film, News. You can follow any responses to this entry through the RSS 2.0 feed. You can skip to the end and leave a response. Pinging is currently not allowed. « The Marvel Experience Sets Up In Dallas!